I just posted a new version which makes no big changes, but adds some visual refinements and fixes one bug. 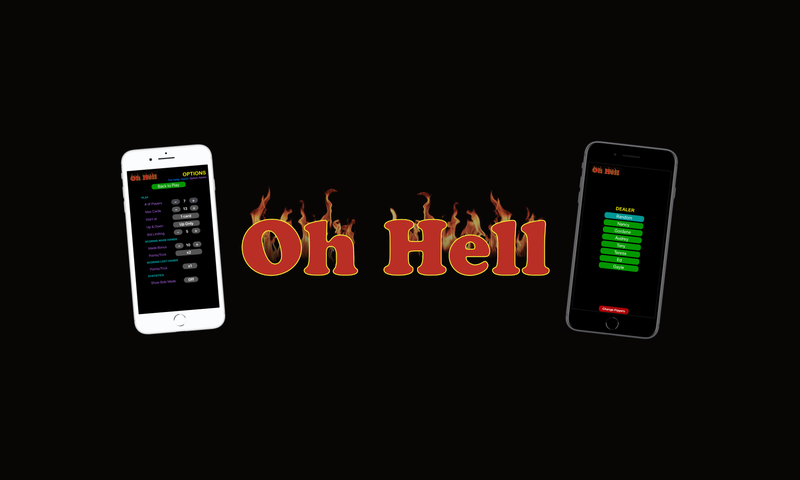 Version 2.0 of Oh Hell Scorekeeper is now available on the iTunes store. Now works with 3-7 players! I’ve tested this version as extensively as I can, but if you should come across any malfunction at all, please email me at nancy@nangeroni.net. Screenshots and/or descriptions of the malfunction, or how to reproduce it, would be helpful. And if you have any suggestions for the next version, please do let me know. This version came about because a user asked for support for more players; the next version could give you features that you would like to see! At the request of a user, I’ve created a new version that will support 3-7 players. It’s in final testing now, and should release later this month. I’ve taken the opportunity to make some other refinements, which will hopefully make the Scorekeeper easier and more satisfying to use. As always, your feedback and suggestions are most welcome. Just email me at nancy@nangeroni.net. Free for the month of January, Oh Hell Scorekeeper is now available on the App Store. After February 2 the cost will be $0.99. I’m in the process right now of setting up beta testing of Oh Hell Scoreboard. This is my first-ever iPhone app, so I’m sure I’ll be making a mistake or three along the way. Please bear with me and hopefully we’ll all end up with a nice scoring app that’s a pleasure to use!